In 1973 the president of the World Bank, Robert McNamara, claimed we would “end poverty within a generation.” We didn’t even come close. Not even in the ball park. Only 15% of the world’s population lives in an advanced, prosperous society. 70% of the world lives on less than $10 per day, 40% less than $2, 17% less than $1. We’ve had our hopes dashed before when it comes to development and democracy, which we should keep in mind as we consider democratization today. Let’s review some history. After World War II and the success of the Marshall Plan in rebuilding Europe, there was great optimism that the advanced countries could help the rest of the world catch up to us in terms of development and democracy, which is why Robert McNamara made that statement. Foreign aid programs, like the Alliance for Progress, which was described as the Marshall Plan for Latin America, were launched. The fact is, these programs never really worked. Then came the independence movement, as country after country in places like Africa and Asia shed their old colonial masters and set off on their own course. Many people felt that these countries, unburdened of the yoke of colonial oppression, would naturally move toward freedom and prosperity. Most did not. Then came the Democracy Movement, as an unprecedented wave of countries in places like Asia, Africa, and Latin America, embraced the ideal of democracy and held elections. Surely this would lead to freedom, development, and prosperity. It didn’t, not really. The result was just poor countries with big corruptions problems who happened to hold elections (i.e., “dysfunctional democracy). Most recently there came the end of communism, which would surely allow countries burdened by a bad system, to soar. Most of them did not. Lastly, I’ll mention that, along with the Asian Tigers of Taiwan, South Korea, Hong Kong, and Singapore, China is the best development story of the last fifty years, yet it receives way more criticism than congratulations. You don’t have to like recent political developments in China. 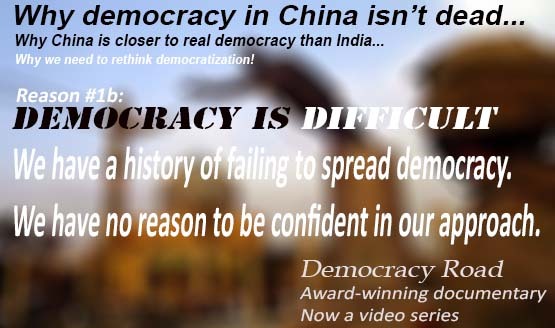 But given our history of disappointment and failure when it comes to spreading development and democracy, isn’t possible China is making more progress than we are giving them credit for? Isn’t it possible we should reconsider how we evaluate countries like China and India, and rethink how development and democracy actually happen?